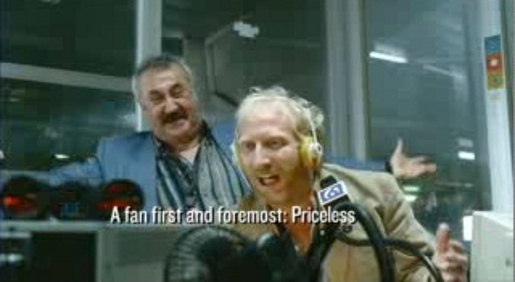 Mastercard is sponsoring the 2008 UEFA European Football Championship and UEFA Champions League, and is using this advertisement to remind everyone how priceless that support is. Italian commentators gesticulate like no one else can, highlighting the costs of an 800 pound lap top, salsa lessons for 150 pounds, a taxi to Rome for 2000 pounds. Waltz music by Strauss is a reference to the games being held in Austria. The 2008 UEFA campaign was developed at McCann-Erickson London by executive creative directors Brian Fraser and Simon Learman, creative director Jason Stewart, art director Ben Brazier, copywriter Johnny Skinner, and agency producers David Graham and Paula Mackersey. Filming was shot by director Ulf Johansson via Smith & Jones Films, with executive producer Philippa Smith, director of photography Barry Ackroyd. Editor was Amanda Perry at Peep Show, London.